In the following graph, the black curve shows the quarterly percentage change in the total hours worked (ABS 6202.0, Tab.19), while the yellow curve shows the contribution of the change in the balance on goods and services (ABS 5368.0, Tab.1) to the change in nominal GDP. The red curve shows the “headline” change in real GDP (ABS 5206.0 Tab.1). 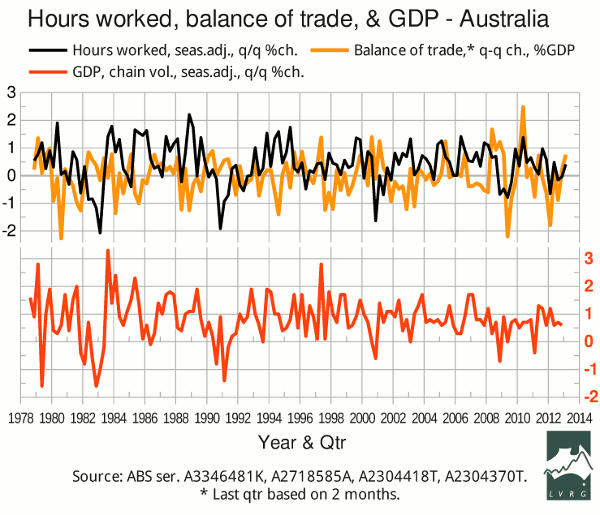 In terms of GDP growth in Q1 of 2013, the total of hours worked is a slightly positive sign. The balance on goods and services is more positive, but based on only two months' data for the quarter.